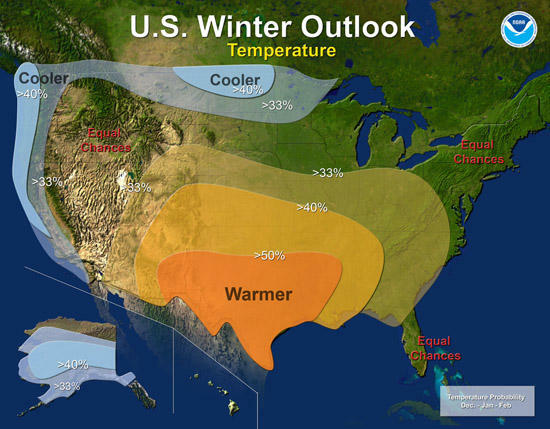 Most of the South and Southeast will be warmer and drier than average through February 2011, according to the annual Winter Outlook released Thursday by NOAA’s Climate Prediction Center. •Alaska: odds favor colder than average temperatures with equal chances of above or below normal precipitation. The interior and southern portions of the state are currently drier than normal. A dry winter may set Alaska up for a greater chance of above normal wildfire conditions in the spring. NOAA's National Weather Service is the primary source of weather data, forecasts and warnings for the United States and its territories. NOAA’s National Weather Service operates the most advanced weather and flood warning and forecast system in the world, helping to protect lives and property and enhance the national economy. Visit us online at weather.gov and on Facebook at http://www.facebook.com/US.National.Weather.Service.gov.